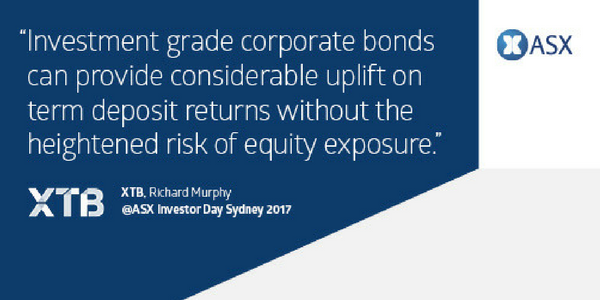 The recent ASX Investor Day seminars which we took part in earler this month were a great success. Over 800 investors registered across the five locations and more than 90% attended on the day. The packed program offered investors a wealth of information focused on the theme of “Investing for Income”. We were very pleased that over a third of attendees registered for one of our eBooks. Spending 30 minutes focusing on the mechanics of corporate bonds and how investors can use them in their portfolios was a wonderful opportunity for us. 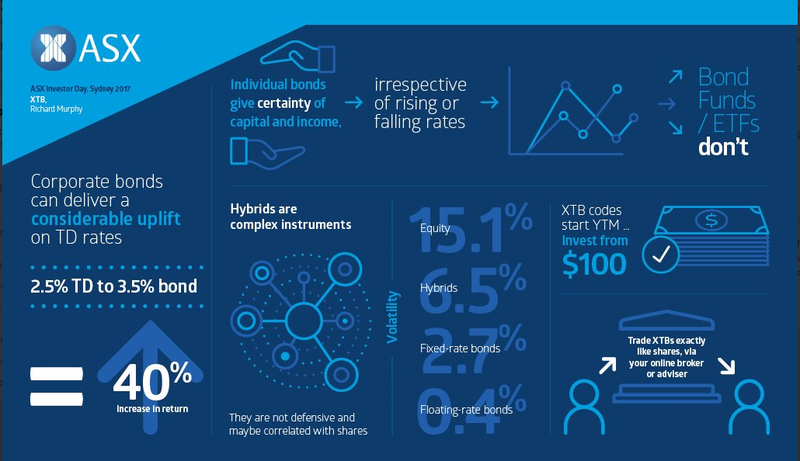 We received a number of comments from investors following the presentation of “now I get it“, “that really helped me to understand the differences between hybrids and bonds“, and many similar comments. Greater need for diversification. Investors should be more aware of the need for diversification. It’s important for investors to move away from portfolios focused soley on Australian equities. They should also include other asset classes e.g. international equities and more defensive fixed income securities. Access to corporate bond returns still largely unknown. We recognise that we still have a lot of work to do to build awareness of XTBs and the access to corporate bonds that they offer. A positive sign is that investors welcomed that XTBs make corporate bonds available in $100 lots. Investors value predictability. A number of attendees commented on the importance of predictability in their portfolios. Most currently used Term Deposits to deliver this defined outcome. Confirmation of growing allocations in cash & bank deposits. Speaker after speaker covered the national statistics of more than $850bn in Household Deposits while Bank Deposit rates are the lowest since records began. For both SMSF and individual investors this offers a real opportunity to make their money work harder in their portfolios. Moving from a 2.5% TD¹ to a 3.5% corporate bond represents a 40% uplift in income. ASX availability is critical. Probably not a great surprise at an ASX hosted event. The demand for ASX-traded products due to their ease of access and holdings via CHESS was mentioned repeatedly as a key benefit. 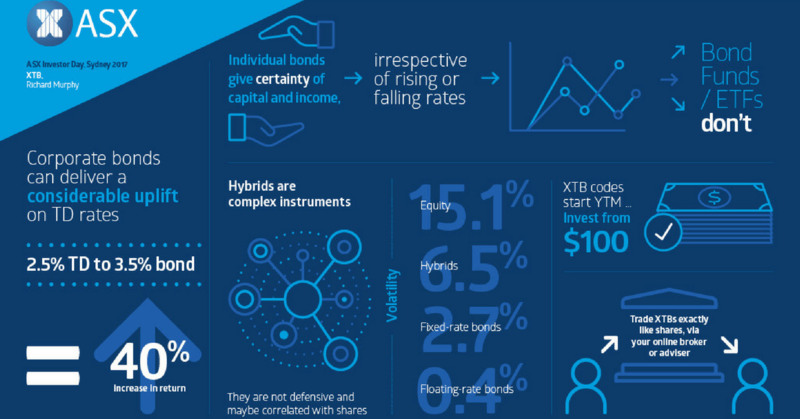 Growing understanding of hybrids being closer to equities. Across speakers and investors alike we found that increasingly hybrids are being seen as a growth rather than a defensive security. The complex nature of many of these products and the lack of defensive characteristics excludes them from fixed income for most investors. Included below are links to our presentation and an excellent summary infographic of its key points, which ASX produced. Also below are links to register for either of our eBooks. They proved very popular with attendees, so if you’ve not read them already, they are well worth a look.